The Orionids should peak this year between October 21 and 25 but “stray” meteors may be expected up to the end of the month. At peak there may be around 25 naked-eye meteors per hour. 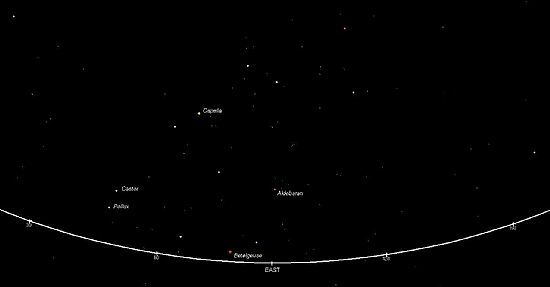 The radiant lies close to the border with constellation Gemini some 5 arc-degrees east of Betelgeuse and on a line between that star and the 2nd magnitude star gamma Geminorum. The radiant rises at around 22 hrs BST over the next four or five nights. The waning Moon should not be a problem after the 22nd October. The Geminids are expected to put on a good showing this year, 2015. Activity is likely to occur between December 8 to December 17, reaching a peak on the 14th in late afternoon/early evening. The crescent Moon (phase 12.2%) sets at 19h 06m UT on the 14th. At maximum, one may expect to see up to 100 meteors an hour, always weather permitting of course. 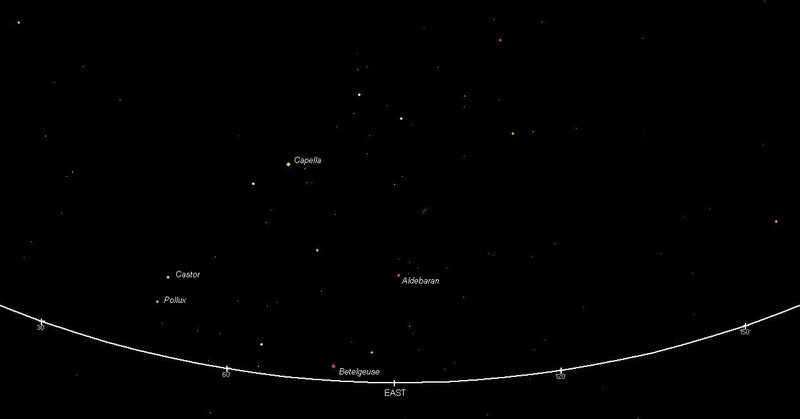 The radiant will lie a few degrees to the north of the star Castor (see dia.1). Dia 1: The sky looking east from the location of Orkney at 18h 00m UT on December 14th 2015. What are meteors? The visible manifestation we refer to as meteors or "shooting, stars" are solid material from our extra-terrestrial environment falling through the Earth's atmosphere at high speed that through friction causes the material to heat to combustible levels. This material may be a fragment of rock or debris from probes, artificial satellites etc. Near space is literally a "dustbin" resulting from the thousands of items we have put into Earth orbit over the past four decades or so. Material that burns up before reaching the Earth's surface is referred to as a meteor, that which survives the fall to strike the surface of the Earth are called meteorites. Literally thousands of small fragments, entitled to be called meteorites, go undetected each year. Meteors are to be seen on any clear, dark night. However, meteor displays or showers occur regularly and these are the result of debris from a comet (or asteroid) that follow an orbit or path around the Sun. 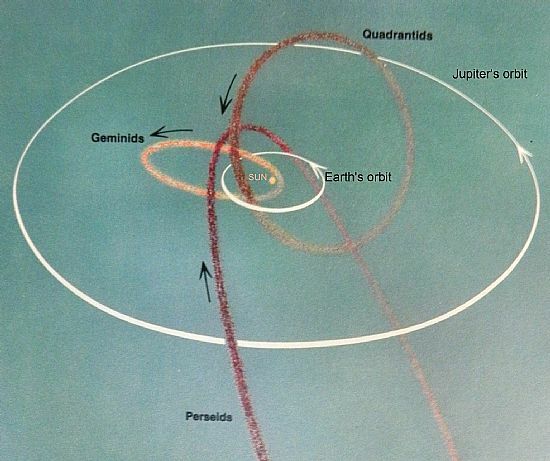 The diagram below (not to scale) shows the orbits for the Geminids and Quadrantids with part of path for the Perseids. The comet responsible for the Geminids is Tempel-Tuttle with an orbital period of 23.2 years. 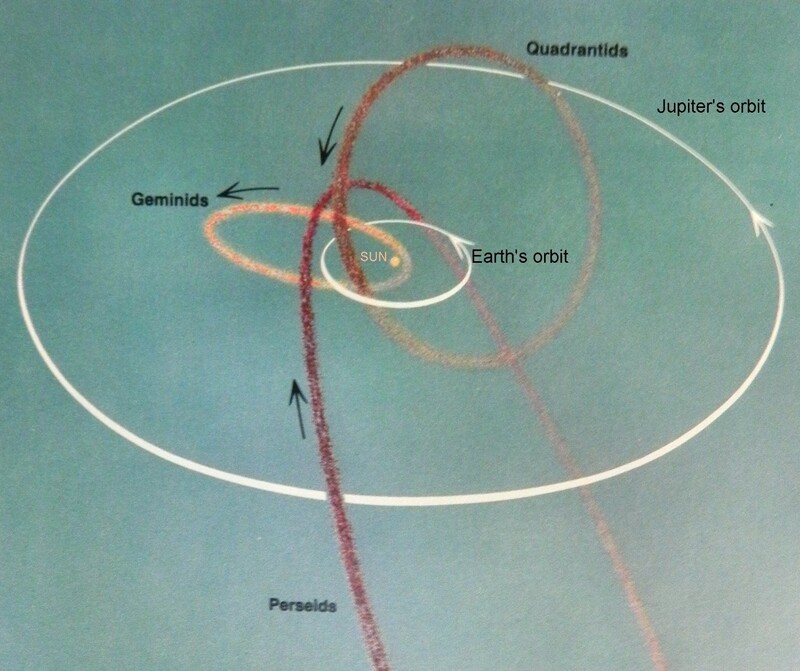 The debris responsible for such showers as the Geminids tend to spread out along the orbital plane. It will be seen that the Earth passes through this debris annually thereby giving rise to meteor displays. The Geminids tend to offer a range of meteors some very bright and relatively slow moving often leaving a luminous trail that may persist for several seconds.